Would you believe a pickup hockey game and some cold beers in the locker room afterward helped bring an NHL team back to Ottawa? Cyril Leeder said the genesis of the idea occurred in the "true Canadian style" in January 1988 as he enjoyed some cold ones at Lyons Arena with Bruce Firestone and Randy Sexton. They were executives at Terrace Investments, a real estate development company, and would be the principals involved in changing the sports landscape in Ontario forever. "We're having a beer in the dressing room," Leeder said, "and Bruce thought the League expanded on a fairly regular basis and it had been a while since they expanded and they likely would be expanding soon and that Ottawa should get a team and our firm should lead the charge. "The next two years, we were basically hard at it trying to pull together a bid and support for a hockey team in Ottawa." The Canadian capital was awarded a franchise on Dec. 6, 1990, and it would play its first game on Oct. 8, 1992. The arrival of the Senators, along with the Tampa Bay Lightning, gave the NHL 24 teams. 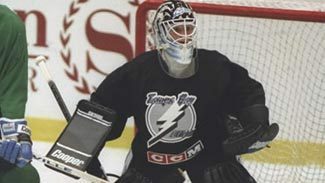 The process of securing the bid and that first season were filled with obstacles and hardships, but it laid the groundwork for one of the more successful teams of the 2000s and created some fond memories for players who were either near the end of their careers or just getting started in the NHL. All Firestone, Leeder and Sexton had to do was scrape together the $50 million expansion fee and, for good measure, they showed a display of Ottawa pride and enthusiasm at the Board of Governors meeting in Palm Beach, Fla., by bringing along a marching band to help seal the deal. As the Terrace group made its pitch, the Ottawa Fire Department Marching Band began to play outside the offices. It drew laughs from those in attendance but it clearly didn't prevent Ottawa from securing an NHL franchise. The original Ottawa Senators were founded in 1883 and were a franchise in the NHL from 1917 to 1934. Except for a one-season stint by the Ottawa Nationals in the WHA in 1973-74, professional hockey didn't exist in the city. That presented a special challenge for the Terrace group, with Ottawa comprised mostly of fans of the Montreal Canadiens and Toronto Maple Leafs, a pair of Original Six teams with rich histories. Not only did the people of Ottawa need to be convinced to support a team, so did government officials. There wasn't a location within the city where an NHL arena could be built, so the plan was to place it in Kanata, which is about 25 kilometers west of Ottawa. That left the Terrace group with the unenviable task of convincing both a fan base loyal to the Habs and Leafs, and the NHL's Board of Governors, that professional hockey was viable in Ottawa. "We didn't have an NHL-quality arena at the time," Leeder said, "so we really had to put together an arena plan to develop a major complex and getting the right team of professionals behind that -- architects, construction companies. So it was a bit of convincing our own market that we could do it. There was a bit of skepticism here when we first announced it but it didn't take long. It was a bit of a snowball effect. You get a few people behind it and pretty soon we had the whole community behind it." The plan was embraced more quickly by fans than government leaders. The arena was to be built on farmland, which required the area to be rezoned. Though the city of Kanata was on board, the province was not. A groundbreaking ceremony was finally held in 1992, but ScotiaBank Arena, known then as The Palladium, wasn't ready for the Senators until the start of the 1994-95 season. That forced the team to open the '92-93 season at the Ottawa Civic Centre, a 10,585-seat arena that has been home to the OHL's Ottawa 67's since 1967. The rink, which seats most of its fans behind the benches, is quite large for the junior ranks but was substandard in comparison to NHL arenas. "It sat 10,000 people. You sat on the bench and looked up at cement pillars," said Rick Bowness, who coached the Senators from 1992-95 and is currently an assistant with the Vancouver Canucks. "You weren't going to sit on the bench and think you were in an NHL rink. All the fans are behind you so you can hear the noise but we weren't kidding ourselves. We weren't playing in an NHL facility. That rink was as good as it could be." In an inaugural season filled with setbacks and heartache, on opening night, the Senators were as good as they could've been. Ten wins. That's how many victories some pundits predicted the Senators would earn in their first season back in the NHL. It turned out to be an apt prognostication -- the Senators went 10-70-4 to eke out the Washington Capitals' 21-point season in 1974-75 that stands as the worst in NHL history. But on opening night in Ottawa against the Montreal Canadiens, who boasted future Hall of Fame members Patrick Roy and Denis Savard and were coming off a 5-1 drubbing of the Hartford Whalers two nights earlier, the Senators delivered their best performance of the season. Neil Brady scored the franchise's first goal during a second-period power play, and Sylvain Turgeon scored the game-winner in a 5-3 victory against a Canadiens team that would win the Stanley Cup. "That was a special night," Leeder said. "We were kind of worried about our team, if they were going to be good enough to compete, and they came out and played a real heck of a game in beating Montreal that first game. We thought, 'Geez, maybe we're not going to be that bad.' But then we lost the next nine games. So it really was that opening night, that special moment." Jamie Baker was coming off his first full NHL season with the Quebec Nordiques and joined his hometown Senators right before training camp. Baker grew up in Ottawa, and his father had season tickets to the Ottawa Nationals during their one WHA season. Baker had an assist in that win against the Canadiens, and the left wing who played 404 career NHL games remembers that night as one his fondest in the League. "I was excited leading up to it, then a little bit nervous the morning of the game," said Baker, now an analyst on San Jose Sharks radio broadcasts. "But honestly, chills. It just gave me chills. I was a part of the first game back in my hometown. That's all you can say. From the mental part, you just had to stay focused. I had to control my emotions during the game. I think everyone was talking about it. I was returning calls. There were a lot of distractions. I was trying to avoid those and focus on the game but it was hard to do that. "That ceremony went a long time. It's probably still one of my favorite renditions of 'O Canada' that I've heard to this day." Before the game, there was a ceremony with more pageantry than an Ice Capades show. There was synchronized figure skating, the raising of Stanley Cup banners won by the original franchise, and the Canadian anthem was performed by an 18-year-old singer named Alanis Morissette, who went by just "Alanis" at that time. "It was a memorable night. It was long, but it was for your team," Bowness said. "You just prepare your team and prepare your staff and say there's going to be some huge distractions here tonight so let's just get ready for it. It was an outstanding opening and a little long, but it didn't matter. It was so well done and so professionally done. Then to have Alanis come out when she was starting her professional career, that was a big thrill for a lot of the guys too." Leeder, now Senators president, said, "I think that night, a lot of people came not knowing what to expect. Most people in Ottawa at that time were either a Montreal or Toronto fan. I think we converted a lot of people that night that came into the building ready to cheer for Montreal and they went away cheering for the Senators." Baker was a little less convinced about the converting. "We didn't do a lot of converting that year," he said. "Montreal fans weren't quite jumping on the bandwagon just yet." There's no sugar-coating just how bad the Senators were in '92-93. After defeating the Canadiens, the Senators lost nine straight before earning a 2-2 tie against the Buffalo Sabres. They would lose another 11 straight before picking up their second win of the season, Nov. 25 against the New Jersey Devils, 3-1 in Ottawa. The Senators endured losing streaks of nine, 11, 11, eight, six and 14 games with winless streaks that were even longer in an era when games could end in ties. They went 21 games and 48 days between their wins against the Canadiens and Devils and allowed seven goals or more seven times in that stretch. It's hard to blame the players, many of whom were selected in the 1992 Expansion Draft in June. Twenty-one teams were allowed to protect two goaltenders and 14 skaters while the San Jose Sharks were exempt from the process after joining the League the previous season. That left the Senators and Lightning picking through scraps that were cast off by the NHL's established franchises. It got so bad during the season that at one practice, a fan tried to join the Senators and help out. "Vincent Pun shows up at practice one day with brand new hockey equipment and goes up to Mike Peluso and says, 'I'm here to help,' " said sportswriter Bruce Garrioch, who has covered the Senators throughout their existence. "Peluso says, 'Well get out there and give us a hand.' So he puts on his equipment and jumps on the ice. He can't skate. After five minutes, Peluso skates over to him and tells him to get off the ice or every practice we have from now on will be closed to the public." It was a grueling, thankless and sometimes excruciating season for a group of athletes who prided themselves on being the best but found themselves on the winning side 10 times in six months. But it wasn't as bad as it could've been -- everyone on the roster had an idea of what to expect going into the season. "As history shows, it was just a team that was kind of piecemealed together, a lot of guys who were playing in the minors," Baker said. "I was just breaking into the League. They had some old veterans like Brad Marsh, Laurie Boschman, Doug Smail, some guys who had been around. It was a long year. "I remember some people predicting the team would win eight or 10 games. Someone predicted 10 games, which means you have to win a game basically every eight games. We won our first game and we were showering afterwards and (goaltender) Peter Sidorkiewicz and I are joking around saying, 'Here we are, boys! Here we are, boys! We don't have to win our next seven games. We've done our job!' We weren't laughing like 16 games later when we hadn't won yet. We were like, 'Why did we say that?' We didn't think we were going to be good, but we didn't think we were going to be that bad." Garrioch recalled a trip to Boston on which the team was smacked in the face, although it happened off the ice and was quite inadvertent. "They had a bunch of character. They didn't expect to win. They lost a lot but took it well. They were a good bunch of guys." As hard as it was for the Senators to win at home, they found it impossible on the road. They set an NHL record that will almost surely never be matched -- they lost 38 straight road games to start the season. They reached overtime twice on the road in that stretch, and in an era when points weren't given for being tied after 60 minutes, the Senators hadn't earned a single point away from Ottawa. That all changed on Long Island on April 10, 1993. 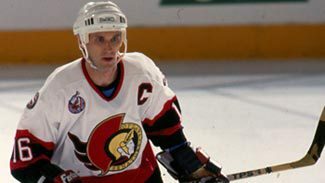 Boschman had a hat trick and Sidorkiewicz made 43 saves when the Senators beat the New York Islanders for their only road victory of the season. True to their reputation of not letting a nightmare season bring them down, Boschman celebrated like he had just won a championship. "Laurie Boschman's in the middle of everyone yelling, 'We're going to Disneyland! We're going to Disneyland!' " Baker said. "So the one thing about that team is we all stuck together. As hard as it was, even though there were no expectations for that team within the city, as a pro, you don't like to lose. You're like, 'Oh, it doesn't matter.' It mattered a lot. It was a long year but we stuck together and still had fun and still worked hard and still competed even though we weren't that skilled as a team. "It was brutal at times. You're losing games. I think I read a quote that year that was something like, 'There's a win-loss column, there's no column under 'E' for effort. There's a win, a loss and a tie.' We were working hard, but when you keep racking up L's and T's, you need a few W's here and there. It was a long year but it was a great group of guys."